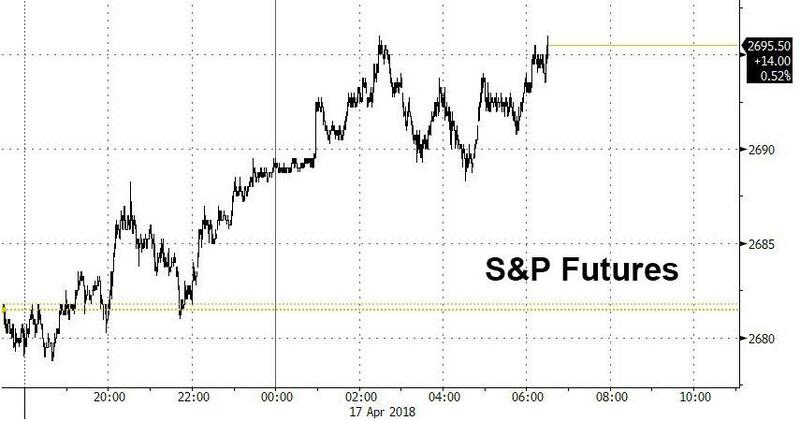 US equity futures continued their Monday ramp, rising 0.5% alongside advancing stocks in Europe after investor focus shifted to earnings and the economic outlook, and away from fading geopolitical and trade war risks. The result is another sea of green in our futures screen this morning. US Futures shrugged off weakness in Asia to point to a higher U.S. open as traders awaited results from companies including Goldman Sachs, while Europe's Stoxx 600 Index rebounded from Monday’s drop. The dollar initially flirted with the lowest level in two months in the wake of President Donald Trump’s latest verbal foray into exchange rates, before U.K. wage growth including bonuses missed estimates and a survey showed German investor confidence tumbling. The pound and euro edged lower (after another notable ZEW miss, see below) as the dollar rebounded sharply. Stocks were encouraged by the limited fallout from a U.S.-led strike on Syria over the weekend - except for the occasional daily Israeli airstrike on Syria - while the U.S. government's announcement it has not decided on additional sanctions on Russia suggested tensions between Moscow and DC are easing. Meanwhile, investors are counting on Q1 earnings, expected to post the biggest Y/Y earnings increase since 2011 thanks to Trump's tax reform - to fuel a recovery in equities and are looking for hints on the monetary-policy outlook from Federal Reserve officials due to speak this week, including incoming New York Fed President John Williams. As Bloomberg adds, corporate earnings should offer some distraction for investors after a torrid period for stocks, but there remain no shortage of other catalysts waiting in the wings to roil markets. Trump’s latest intervention in currencies comes at a time of already elevated geopolitical tension, and ongoing fears of a lurch toward global protectionism. 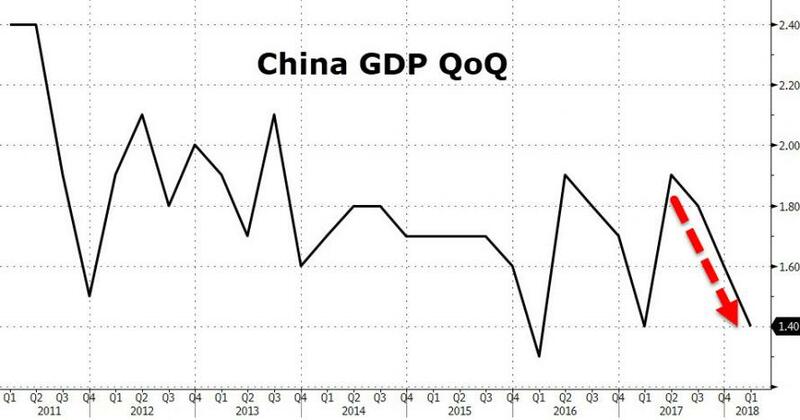 Meanwhile, the macroeconomic backdrop leave quite a bit to desired as overnight China’s Q1 GDP print just met estimates (on a Y/Y basis and missed Q/Q) while industrial production in March came in below forecasts. China Q1 GDP YoY MEET at 6.8%, versus +6.8% exp. and +6.8% prior. China Retail Sales YoY BEAT at 10.1%, versus +9.7% exp. and +9.4% prior. 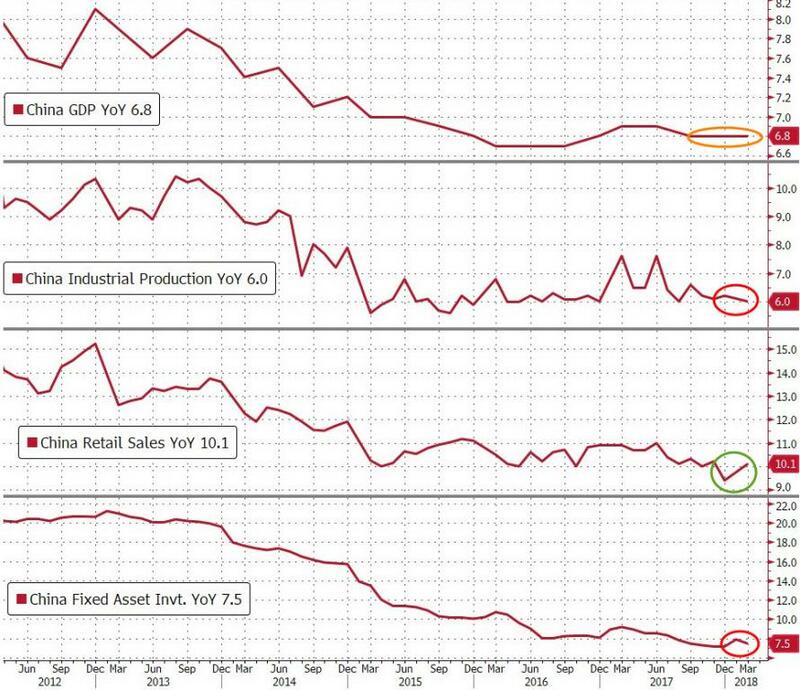 China Industrial Production YoY MISS at 6.0%, versus +6.3% exp. and +6.2% prior. China Fixed Asset Investment YoY MISS at 7.5%, versus +7.7% exp. and +7.9% prior. To be sure, trade war rumbling remain: earlier in the session tech shares slumped on the MSCI Asia Pacific Index after China’s ZTE Corp. was blocked from buying crucial American technology and its suppliers fell. The dollar fell in U.S. trading after President Donald Trump took to Twitter to accuse China and Russia of “playing the Currency Devaluation game” as the U.S. raises interest rates. GBP/USD rises to 1.4354 in Asian trading, highest since Brexit, as purchases from leveraged accounts takes out sell orders from ex- Asia funds above 1.4340. Aussie dollar declines on macro selling after mixed China data while kiwi falls as it tries to consolidate under resistance around 0.7400. The Bloomberg Dollar Spot Index came under intense pressure during Asia hours, touching its lowest level since Feb. 16; however it rapidly pared its drop after London stepped in, before erasing its entire move lower as German ZEW data missed estimates. This also sent the euro to session lows at 1.2365 as of 6:30am ET, versus a three-week high of 1.2414 reached earlier. 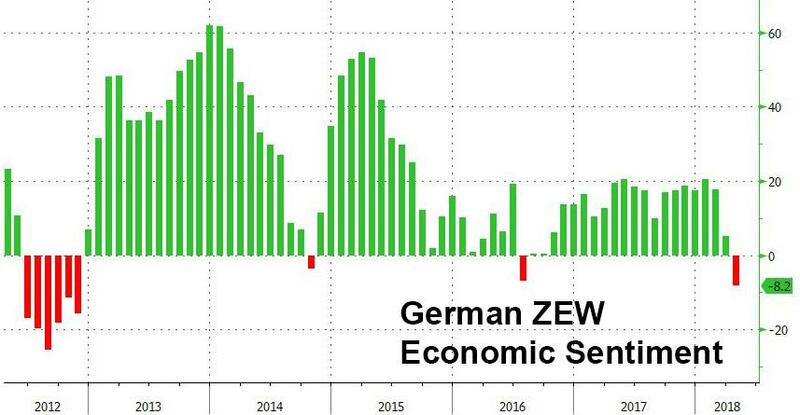 While the days German ZEW data moved the currency market seem long gone, investors took notice this time around as investor confidence tumbled to its lowest level since late 2012 due to mounting risks to global trade. Until the European open, the yen advanced to session high against the dollar on concern currency issues will surface at a meeting between U.S. President Trump and Japanese Prime Minister Abe that starts Tuesday. However, as the dollar rebound picked up steam, the Yen slumped and was trading largely unchanged at last check. The pound erased early gains as U.K. labor data failed to provide fresh stimulus to bulls who opted to take profit on part of their exposure. China is prepared and ready to start trade countermeasures; according to China Foreign Ministry spokeswoman. Mexico Economy Minister Guajardo says 10 NAFTA chapters are already concluded or close to conclusion adds they are exploring a possible meeting with USTR Lighthizer on Thursday but is not expecting a major announcement regarding NAFTA on Thursday. China diplomat warns that UK trade discussions with China would face significant uncertainties if UK fails to strike a Brexit deal with the EU. Syrian TV reports that air defenses are responding to missiles over Syria's Homs and that there is an unidentified aircraft over Damascus. North Korea and South Korea are reported to discuss announcing a permanent end to military conflict, according to press reports. In rates, the U.S. yield curve slightly steepens in Asia with 10-yr yields edging up 1bp to 2.83% while 2-yr yield is little changed at 2.37%. The 5s30s curve broke below 35bps in U.S. session to touch its flattest level since August 2007. Oil steadied at $66.57 a barrel for U.S. crude and $71.66 a barrel for Brent having tumbled nearly 1.8 percent overnight as concerns over Middle East tensions eased. Gold (-0.4%) prices have dipped lower, closer to the bottom of the range but losses are modest at best. Chinese iron ore futures extended losses and hit a 10-month low on concerns of a supply glut. On the flip side, London aluminium futures extend their rally to the highest level in almost seven years, buoyed by growing concerns that the aftermath of the US sanctions on major Russian producer Rusal will result in tighter supply conditions. China’s economic expansion held up amid robust consumer spending, underpinning global growth and giving authorities more room to purge excessive borrowing, while the industrial sector showed signs of modest slowdown. 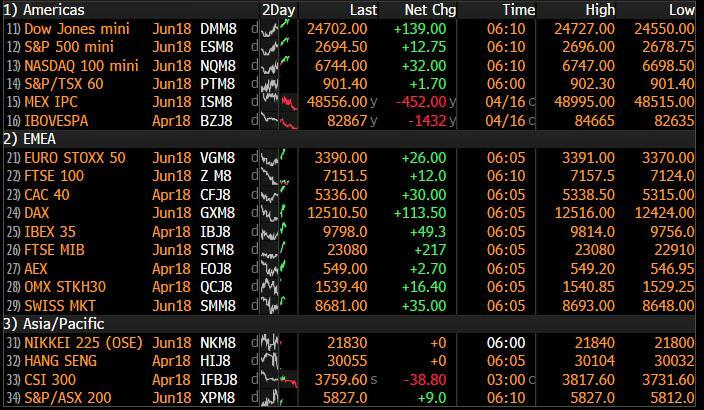 Asia equity markets traded with a somewhat indecisive tone after the positive momentum from Wall St waned as the region digested mixed tier-1 data releases from China including GDP. ASX 200 (+0.2%) saw mild gains amid a slew of corporate updates, while Nikkei 225 (Unch) was flat with price action contained by a firm JPY. Hang Seng (-0.83%) and Shanghai Comp. (-1.4%) were choppy in reaction to the mixed data figures in which GDP Y/Y printed inline with estimates at 6.8% which surpasses the official target for 2018, while Q/Q printed slightly below estimates at 1.4% vs. Exp. 1.5%. Furthermore, Industrial Production also disappointed but was counterbalanced by solid growth in Retail Sales. Finally, 10yr JGBs were relatively flat amid a similar picture seen in riskier assets in Japan, while a 5yr JGB auction also failed to spur price action despite slightly firmer demand and higher prices, as this was in tandem with a lower amount sold. European equities have shown strength (Eurostoxx +0.3%) on the back of improved risk sentiment with Syrian tensions continuing to abate. This is most noted in the materials and IT sectors, with both leading their peers. Negativity is noted in consumer discretionary, led by Reckitt Benckiser (-2.6%) on a broker downgrade by Credit Suisse. Elsewhere, Chinese permission for foreign auto companies to set up more than two ventures has led to auto names strengthening with Daimler rising from EUR 65.24 to EUR 65.44 and BMW up from EUR 90.47 to EUR 91.10. GKN (2.2%) have been supported with Melrose expecting an offer to become unconditional by April 19th, AB food (+2.6%) are higher amid an earnings beat and Bayer (2.0%) have been lifted by the news that the co. has agreed to sell 3.6% of new shares to Singaporean state investment company Temasek for EUR 3bln; this comes as the company plans for a USD 62.5bln takeover of Monsanto. In commodities, taking a look at the commodities complex, oil prices consolidated from the overnight gains with WTI (-0.1%) and Brent Crude (- 0.1%) modestly lower on the day as concerns of supply disruptions in the Middle East temporarily fade, whilst rising US shale outputs is on traders’ minds ahead of the API weekly inventories later today. Moving onto the metals bloc, gold (-0.4%) prices have dipped lower, closer to the bottom of the range but losses are modest at best. Overnight, Chinese GDP printed in line at 6.8%, above the government’s target of around 6.5%. However, industrial output came short of the expected 6.3%, whilst daily steel output in March climbed to the highest level since September. In turn, Chinese iron ore futures extended losses and hit a 10-month low on concerns of a supply glut. On the flip side, London aluminium futures extend their rally to the highest level in almost seven years, buoyed by growing concerns that the aftermath of the US sanctions on major Russian producer Rusal will result in tighter supply conditions. Looking at the day ahead, in Europe the most significant releases are UK employment stats for February and March, and Germany's April ZEW survey which as noted above tumbled to the lowest since 2012. In the US we'll get March housing starts and building permits as well as March industrial and manufacturing production. Today is a busy day for Fedspeak with Williams, Quarles, Harker, Evans and Bostic all slated to speak. Meanwhile, President Trump is due to welcome Japan PM Abe, while the IMF and World Bank Annual Spring Meetings will commence, concluding April 22nd. Goldman Sachs is the earnings highlight along with IBM and Johnson & Johnson. Markets were generally passported back to better times yesterday as they breathed a collective sigh of relief after there was no ramp up in rhetoric or escalation to the Syrian missile strikes over the weekend. Indeed, even another fairly controversial Trump tweet (more on that below) did little to dampen the generally upbeat start for risk as the S&P 500 (+0.81%) moved back into positive territory for 2018 for the first time since mid-March. The ViX (16.56) also hit its lowest since mid-March and is down 33.4% from its recent high. The Dow (+0.87%) and Nasdaq (+0.70%) also finished higher although prior to this European markets did actually fade at the close to finish slightly lower. The Stoxx 600 in particular ended -0.39%. Treasuries on the other hand were a bit weaker but the reality is that they continue to just ebb and flow in this fairly tight range at present. 10y Treasuries ended last night unchanged at 2.828% (a high of 2.86% and threatening to break out though) which means that they’ve stayed in a slightly greater than 20bp range since the start of February even though they climbed 30bps during January. Bunds continue to bump along the bottom of their recent yield range and it is worth noting that the 2y Treasury-Bund spread closed at 296bps, marking a fresh high since the reunification of Germany. Elsewhere, WTI oil fell for the first time in six days to $66.22/bbl (-1.74%) while LME aluminium jumped 4.99% yesterday to the highest since September 2011. Overnight the main focus has been on China where we’ve received the Q1 GDP print which was in line at 6.8% yoy and steady since last September. In addition to that we’ve also had the March activity data, with retail sales above market (10.1% yoy vs. 9.7% expected) while the March IP eased 0.2ppt mom to 6.0% yoy (vs. 6.3% expected). After the bell in the US, Netflix’s share price jumped c5% after reporting better than expected growth in subscribers. This morning in Asia, markets are mixed and little changed with the Hang Seng and Nikkei broadly flat, the ASX 200 is up +0.25% while the Shanghai Comp. is down -0.35%. 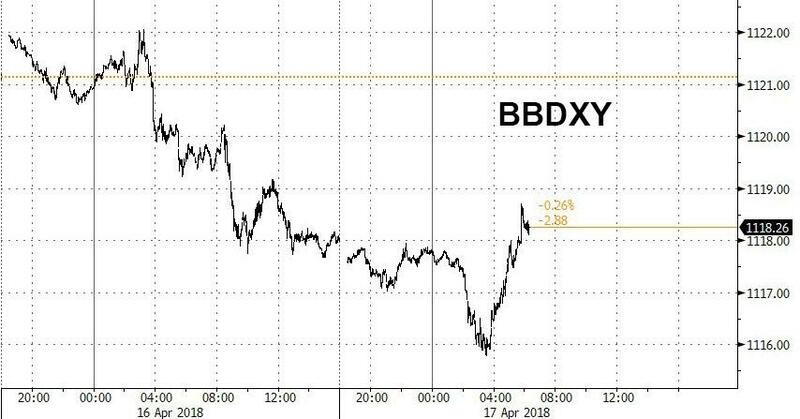 Back to yesterday, the tweet that we referred to at the top from President Trump which attracted the usual attention was: “Russia and China are playing the currency devaluation game as the US keeps raising interest rates. Not acceptable!”. The USD was weaker in response but in reality was already declining before the President tweeted. Still, this was the first reference to FX policy by the President in some time however it perhaps says something that the Predata Trump Presidential Volatility Index – which measures fluctuations in online discussions about the multiple political controversies surrounding the administration of Trump (similar to PVIX) – is still below the highest levels in January, February and March this year, and indeed most of last year, suggesting a bit of fatigue perhaps in Trump’s social media comments. In other news, US banks actually lagged a bit yesterday despite the move higher for bond yields and also slightly better than expected results for BofA. On the latter, the Bank reported EPS of 62c for Q1 which was ahead of the 59c consensus following cost cuts, while revenues also marginally beat expectations. That continues what has been a generally solid set of results for US banks so far with all 4 banks having beaten earnings expectations and 3 of 4 beating on revenues (1 in line). As a reminder, today we’ll get Goldman Sachs’ results. Now moving onto the four Fed speakers on rates and inflation. The Fed’s Dudley noted that “as long as inflation is relatively low, the Fed is going to be gradual (on rate hikes)”, but “if inflation were to go above 2% by an appreciable margin, then I think the gradual path might have to be altered”. Following on, Mr Kaplan expects the Fed to hike rates two more times this year and more next year. He added that “I don’t have a problem with being restrictive” on rates, provided rates do not rise above the 2.5%-2.75% range that he estimates as their “neutral” level. Further, rate hikes should not move up so fast or far which leads to an inverted yield curve. Conversely, Mr Kashkari noted “there are now indications that inflation is gradually starting to move toward our 2% target”, but “I don’t see signs of any sudden acceleration in inflation or overheating”. Hence, “its’ hard to say when the Fed should raise rates again”, in part as he “prefers not to make such predictions because (he) wants the data to guide us rather than some promise that we’ve made”. Finally, Mr Bostic noted the Fed has not seen much movement in wage growth while “we’re having a conversation why we have struggled to reach” the Fed’s 2% inflation target. Back in Europe, the ECB’s Praet noted “the growth outlook confirms our confidence that inflation will converge toward our aim of close to 2% over the medium term” but reiterated that inflation developments “remain subdued” and ample degree of stimulus remains necessary. He also played down the recent softening in Euro area economic data, as it followed “several quarters of very strong growth”. Elsewhere, the ECB’s Visco noted Italian banks have improved but there are ‘still some weakness” and banks overall must take advantage of the current favourable conditions to improve their balance sheets and profitability. Turning to the some of the other headlines in the US, the White House has confirmed that President Trump intends to nominate Richard Clarida as the next Fed Vice-Chair and Kanas State Bank Commissioner Michelle Bowman to fill one of the vacant Fed Governor positions. Mr Clarida is a Columbia University professor and an MD at Pimco. On the nominations, the Fed’s Kaplan said he has known “Rich for many years” and “thinks extremely highly of him”. Overall, he “don’t know (if the new nominees) will change the dynamic around the table”. Elsewhere, the White House has noted the new sanctions on Russian firms as flagged by the US ambassador to the UN are not imminent, in part as the Washington Post noted President Trump is not comfortable with the additional measures yet. Moving on, the US Treasury noted China’s holding of US debt increased $8.5bn mom to $1.18trn in February, marking the largest monthly increase in six months. Finally, the US Commerce Department has imposed a 7 year ban on the Chinese telco. company ZTE Corp. from buying sensitive technology from US suppliers, as it alleged that the company engaged in illegal conduct and making false statements to US authorities. As we type, the ZTE shares are in trading halt in HK. Away from the micro, there was a bit of US data to also digest yesterday with the March retail sales report. There were no great surprises in the data however with both ex auto sales (+0.2% mom) and control group sales (+0.4% mom) printing in line with expectations. Headline sales (+0.6% mom vs. +0.4% expected) did surprise to the upside. It’s also worth noting the April empire manufacturing print which came in at a much softer than expected 15.8 (vs. 18.4 expected) and down nearly 7pts from March. Of most significance was the fall in the outlook component with the index for future business conditions falling 26pts to 18.3 and to the lowest in a bit over 2 years. It was also the biggest monthly decline since September 2001. So signs that the heightened protectionist measures in recent weeks are weighing on the outlook for businesses in the sector. Elsewhere, the February business inventories was in line at 0.2% mom. Factoring in the above, the latest Atlanta Fed’s estimate of real PCE and GDP growth are 0.9% saar and 1.9% saar respectively. Looking at the day ahead, in Europe the most significant releases are UK employment stats for February and March, and Germany's April ZEW survey. In the afternoon in the US we'll get March housing starts and building permits as well as March industrial and manufacturing production. Today is a busy day for Fedspeak with Williams, Quarles, Harker, Evans and Bostic all slated to speak. Meanwhile, President Trump is due to welcome Japan PM Abe, while the IMF and World Bank Annual Spring Meetings will commence, concluding April 22nd. Goldman Sachs is the earnings highlight along with IBM and Johnson & Johnson.